Great post, very informative. Explained a lot of the stuff I’d been cargo-culting and a few things I thought I understood but had gotten wrong. Thanks for the detailed explanation! I had serious trouble getting the depth mapping in my DoF shader to match the one used by opengl (well, Blender anyway). It’s one of those things where you don’t even know if you’re on the right track until you get it spot on. Excellent article ! It took me several readings, but the perspective transformation finally made sense. 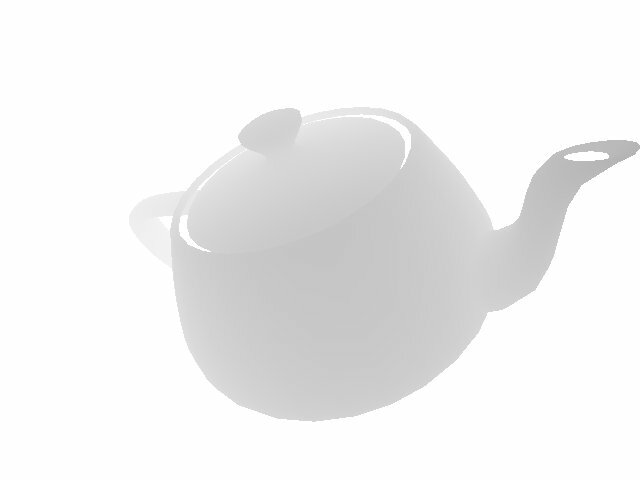 I now know how GopenGL ‘magically’ clips my objects when I haven’t told it where my near/far clipping planes are. Thank you for very understandable derivation of perspective projection matrix. I am watching the edX course on CG and couldn’t get it until I read your article. Great Job! It’s very clearly written and easy to follow. gluPerspective is not part of the OpenGL spec so it’s hard to find a good reference… Thanks for sharing! But it was removed in 3.0. Glad you enjoyed the post! Ah, good tip! I use this reference from time to time but never noticed they provide the actual projection matrices (due to the bad page formatting). In the OpenGL reference that I used last time (http://www.opengl.org/registry/doc/glspec43.compatibility.20120806.pdf), the gluPerspective matrix is not described (they only briefly discuss Ortho & Frustrum in the sec. 12.1.1). Right — the reference I linked you to was the OpenGL 2 spec — the last one to include gluPerspective. You’re looking at the 4.3 spec. I think it’s good that all of this built-in functionality is being removed (since it is much more powerful if you can write it yourself), but one of the unfortunate things about all this removal is that it makes it a damn lot harder to learn it yourself, because it is no longer there in the manual. In my case I’m porting a DX engine, fully shader based and fully left-handed coordinate system based, engine to IPad – and therefore OpenGL ES 2.0. Of course I wanted to use the same camera code on both platforms, so my view (and therefore also “MODELVIEW”) matrix is using a left-handed coordinate system. In short – shader based OpenGL does NOT force any coordinate system on you. You can use right-handed or left-handed code as you please. You are responsible for the vertex pipeline all the way to NDS. OK, so let’s assume that we want to keep as much code as possible shared among DX and OpenGL… so we’ll stay in a left-handed coordinate system. 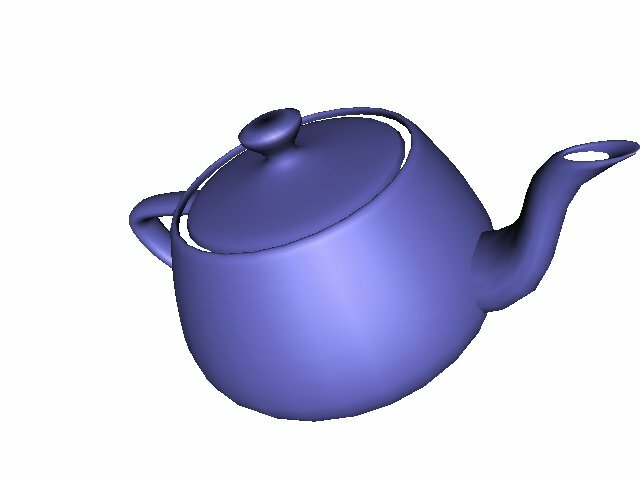 Using a “DirectX” view matrix, vertices in view space will have positive Z values. That is, the camera is looking down +Z. This also means that we cannot use standard OpenGL projection matrices (which assume a camera view direction along -Z, as described excellently in this blog). We also cannot use a standard DirectX projection matrix, since those will map to a NDS where the Z-range is [0..1], and not [-1..1] like OpenGL. Using a DirectX projection matrix “works”, but it’s only utilizing a small percentage of the precision in the Z-buffer. Excellent notes. Thank you. I should have been clearer that the right-hands role ESD only the default. Thanks for pointing or that it’s easy to change. Holy moly(sp?)! This is the first time I’ve seen this subject explained SO clearly. Mad kudos and a job well done. Keep up the good work!!!! I think (1, 1) should be upper-right. Good spotting, No Thanks. Fixed. Saw your post Googling for tips on projection matrices . . . great article! Explained some things that were giving me a really bad time. Awesome. Great job explaining all of this. I needed a refresher since my last graphics class and this was perfect. Really Great post. Thanks a lot. It really help me out much. With your help I was able to derive the perspective matrix for myself. This is an awesome post. Thanks a lot! Thank you so much, this is a great article and I learned a lot!! This is a really good explanation. I particularly like how you relate the depth buffer to looking at an object in a foggy room – those sorts of explanations are really useful. Thanks! Btw, “fovx = aspect × fovy” is incorrect. Oh yeah… you’re right my calculation is incorrect. 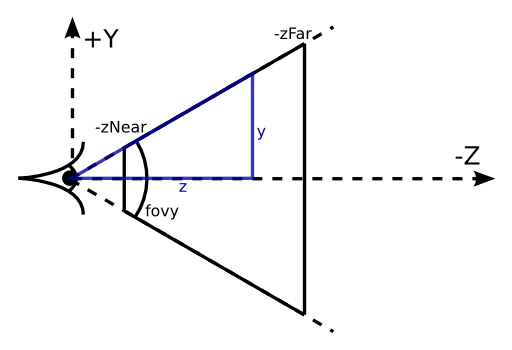 Yours is also slightly wrong, because fovx and fovy are the angles of the whole screen width/height, and you are calculating the half-screen width/height: fovx/2 = atan(aspect * tan fovy/2). Updated the blog post with the correct calculation. Thanks! Surely it should be 1/tan(fovx/2)? Nice article and all, but it still doesn’t tell me how to go from world coordinates to viewport coordinates. 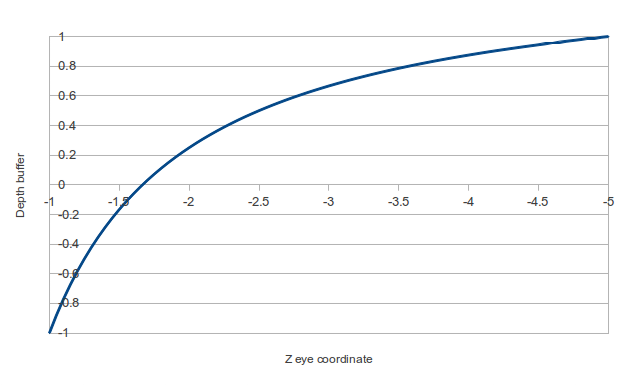 This article is a deep-dive on the Projection matrix, which transforms Eye coordinates to Viewport. I didn’t have space to cover the whole pipeline. To go from World to Eye, you need a View matrix which is basically the set of camera transforms (rotation and translation) to position objects in the world relative to the viewer. Thus, to go from World to Viewport, you just multiply the View and Projection matrices together (which OpenGL does automatically for you; at least it did in old versions).